Malihabad: It is called Anarkali although has no relationship with either pomegranate or bud. 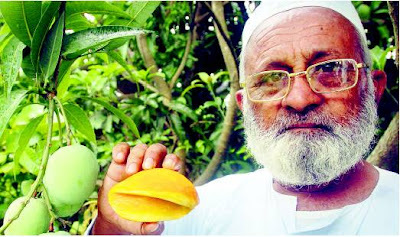 Instead, this variation comes staright from the heart of Padma Shri Haji Kaleem Ullah, father of mango grafting. Anarkali is the latest addition to his collection of ‘unique’mangoes. “It appears to be a rare of the rarest specie. It is a connoisseur’s delight who swear-in to serve a perfect blend of aroma, taste and appetising sight. Anarkali has all the three traits,” said the man who took to mango grafting way back in 1957. Anarkali has a double skin. Haji saaheb peeled off the first green layer finely with a Chinese knife. “Orange is the colour of the first layer,” he said. He then showed the mango to a group of anxious admirers at his orchard in the heart of Malihabad. Dilated pupils wondered ‘what is so special about the mango’. But before anyone could give words to the doubt, he made a deeper stroke in the mango and exposed its second yellow coloured skin. “The show does not end here,” said the man. He carefully sliced a piece from the mango and showed the deep yellow and rusty orange pulp. What makes Anarkali ‘doubly’ interesting is its taste. “It tastes like a Chausa,” said a visitor after trying the first bite. But minutes later, she took the second slice and corrected herself. “I think it is a luscious combination of chausa and Lakhnavi dashahri,” she said. He believes that Anarkali would surely find admirers in Americas and Europe because it is less sweeter than other mangoes. “But before going off-shores, it will pose a threat to Dashahri,” he predicted. He, however, said it would take about 3-4 years for the commercial production of Anarkali to start.